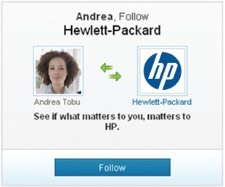 If you’re in B2B, are you using LinkedIn to its full potential? The good news is that LinkedIn can form a valuable part of your content marketing strategy. There are some easy ways to use the platform to get more eyeballs on your content and build your brand, along with your influence, authority and of course traffic back to your site. This post gives you 5 key content marketing strategies for LinkedIn that you can start using today. LinkedIn Publisher is where you can post long-form content on LinkedIn, and attract engagement from network users. As with other forms of content repurposing, repurposing your content on LinkedIn Publisher can attract far more engagement than you would otherwise get through your blog alone. Content posted solely to your blog is tapping into only a small part of its full potential. To get started, click Write an article from the top of the LinkedIn home page. This takes you straight into the publishing platform. Add a cover image at the top. This is recommended to help attract attention for your article. If you don’t add one, LinkedIn will select another image from your article (if you have one) to act as the thumbnail. They recommend a size of 744 x 400 pixels for the cover image. Link elsewhere—for example, try linking to opt-in pages offering content upgrades, and help build your list through LinkedIn. 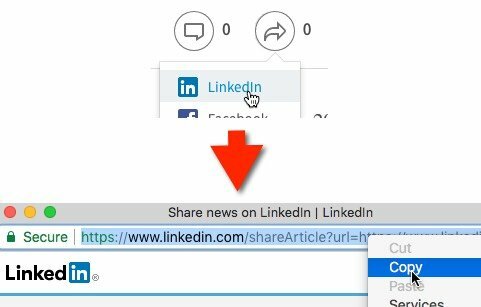 Go back and edit the article, adding some ‘share on LinkedIn’ type links into it. See this article for more tips on using LinkedIn Publisher effectively. If you’re in B2B, engagement levels on LinkedIn can be quite a bit higher than Facebook for example. Your audience are on LinkedIn with a business-focused mindset, so they’re often more receptive to business-related topics. On the other hand, Facebook is often used for relaxation, catching up with friends and family, and for entertainment. In that context, your business-related content is more easily ignored. So if you’re not posting content regularly to your personal feed on LinkedIn, you should be. Information that will help—and appeal to—your target audience. For example, repurpose blog articles as helpful tips you can post. While not generating traffic immediately, this can help attract followers who might then click through on an update at some later point. This doesn’t need to take any time to do. Using vWriter, each time I publish content on this blog, an assistant is tasked with creating several posts for my LinkedIn feed (and the same for other networks). Once signed off, with sometimes the odd update or alteration, they’re then automatically scheduled for publication over forthcoming weeks. So, other than quickly reviewing the posts created, none of it takes up any of my own time. Of course, the effectiveness of posting to your personal feed partly relies on your own level of personal following. 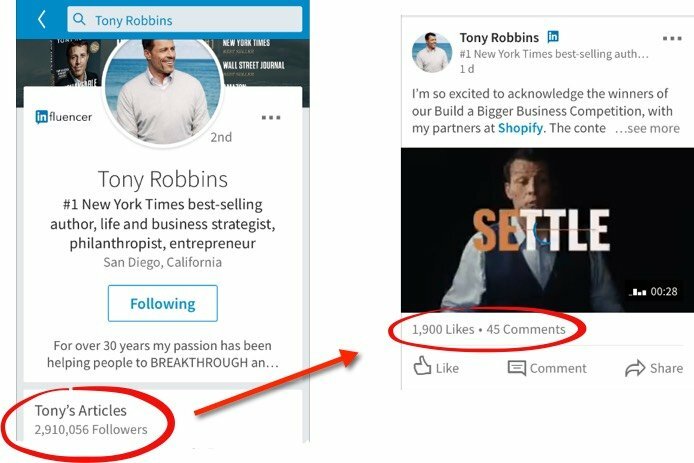 For example, someone like Tony Robbins, with millions of followers on LinkedIn, attracts hundreds if not thousands of Likes and other forms of engagement within just hours of posting. Same with someone like Gary Vaynerchuk. But, whatever your level of followers right now, remember they were once in your position. They got where they are through a lot of determined and focused action. Using the other tips on this page to build your LinkedIn presence. While it can take quite a bit of work in the beginning, when you get to a certain level of followers and connections on LinkedIn it gets easier. You’ll find it begins to accelerate and build increasingly under its own steam. Similar principles apply to your Company Page, and the same type of content can be published. Again, the level of engagement you attract depends to a large extent on your following. Engage your employees – remind them to include your company name within their own profiles, for example within their employment history. In doing so, they are automatically added as followers of your company. In addition, encourage them to share updates from your Company Page with their own networks. Promote your Company Page – link to it from your website, email signatures, email newsletters, your blog and other content platforms. Plus, share the page every so often on other social networks you’re active on. Take part in LinkedIn Groups to help highlight your Company Page and attract followers. See #4 below for more details. Use LinkedIn’s Follow Ads to target the specific LinkedIn users you’d like to attract as followers. When someone follows you, their own network is notified, helping to attract further followers and increase your ROI. Click here for more information on using LinkedIn advertising, including a couple of case studies. There are over one million Groups on LinkedIn and they form a very popular part of LinkedIn’s platform. It’s often easier to attract engagement from within an active Group with an interest in the type of content you share than through your personal or Company Page feed. Start by joining a few relevant Groups and lurk around for a while to get a feel for how it operates and the type of content posted. Take note of the Group rules and ensure you abide by them. 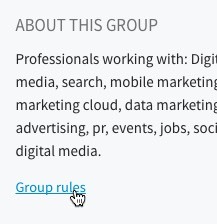 How can you use LinkedIn Groups for content marketing? Check the rules of course, but with many Groups you can simply share content and a link from say your blog or other content platforms where you’ve published. Make sure you’re using the appropriate Social Meta Tags on your blog so your content looks the part when it’s shared (here’s a guide). If simply sharing a link to your content, you tend to attract the most engagement when you include two or three sentences rather than just a straight link. This helps pique someone’s interest, adds value to the Group even for those who don’t click through, and has less risk of attracting the attention of moderators. Finding a discussion that relates directly to your content. Contribute a thoughtful comment to the discussion, while adding a link to your content for further information (similar in some ways to the approach I recommend for Quora). Don’t forget as well to interact with those who leave comments or add further to the discussion. It shows you’re active, keen to interact, and encourages engagement from others. This can all help to increase your reach, and grow it further over time. I’ve covered advertising on LinkedIn in more detail here but, in brief, you can promote content on LinkedIn by paying to give an update to your feed more reach. Some view advertising on LinkedIn as ‘expensive’—but it’s more a case of determining whether or not it gives you a positive ROI, and optimizing a campaign to help it do so. Depending on your type of business, leads generated through LinkedIn can be high value and easier to convert to sales simply because of the type of people the network attracts. With effective use of content upgrades and other opt-in techniques for the content you’re promoting, you might find Sponsored Updates are an ideal opportunity to attract high quality leads for your business. As a quick example, if you’re paying say $3 a click on LinkedIn, and 10% of those who click through become a lead, you’re paying $30 a lead. This can compare well with other paid lead sources and, considering LinkedIn leads often give higher sales conversion rates, can be a profitable source of new sales for many business. That’s 5 of the most effective ways to use LinkedIn in your content marketing. Start incorporating them into your content marketing strategy, keep improving your techniques, and your results will naturally increase over time. Oh, and finally—make sure you connect with me on LinkedIn! I do some of this and will do others. My problem with LIn is that I don’t really do B2B, just with individuals who are either in trouble in life with respect to self-knowledge (so they don’t have good info re their gifts, abilities, and talents and therefore their career choices). Or for their children who are at risk in school. I suppose I can reach them if they have these difficulties but it isn’t ideal as they are not reading Lin for this kind of assistance. I’d have to catch them off guard as it were and divert them to their personal lives instead of biz. Have you got some finesse points re were trying to market fiction on LIN? Hey Frank, it’s best to find the network where the people you’re trying to reach spend most of the time. As you say, it’s doubtful it’s LinkedIn. Possibly Facebook, though if trying to reach children more likely Instagram (tips on using Instagram for business can be found here). Amazing tips . I started my LinkedIn out reach campaign a few months ago and it has been working really well. Thanks for sharing.